@icemember Something close to it unless you can get it exact lol. Ive got a couple weapon requests. Could someone please make me an M1 Garand, Thompson SMG, MP40, Karabiner 98k, and Springfield 1903 sniper rifle thanks. @Lephenix: He said he probably won't release it and it's not done anyway. I don't need anything real nice looking - just a simple box on legs. I have the textures in the picture above. Hey guys could someone please attach the stock jed_inf_jedi head onto the stock Han Solo body? Also if possible could I have that same unit but with a WW2 M1 Pot Helmet thanks! I got a few requests...going to start work on an era mod of mine soon, and I need some custom assets. Most should be relatively easy to do, as they're updating existing models, or hacking new parts on. Serra Fless - Aayla Secure, single orange saber, scaled down to chest-height, and given a small amount of tribal, campeign tattoos on the arms. Sleeveless pale blue top that goes from neck to waist, barely exposing midriff, black pants with black boots in a gold trim. Skin is a deeper blue to Aayla's, with a bit of pink on the bare Lekku. A Phase I clone with a kama and a small version of the Sandtrooper backpack. A Phase I ARF trooper. A Phase I clone with Kama and the "leia-bun" helmet (Phase I helmet with extra hexagons on the ears). 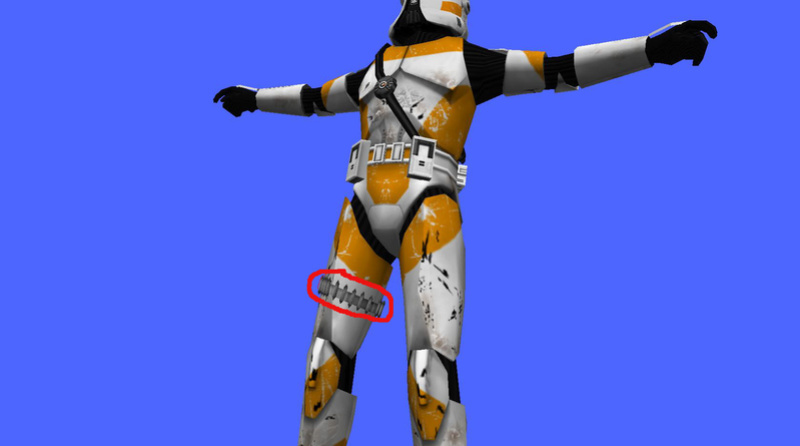 Better model of the Phase I ARC Trooper. Better model of the Phase I Jet Trooper. If references are needed, I can provide them, or try to provide them, just ask or PM me...The Jedi don't have references, they are of my own creation. They are most important first. Rath Deris and Serra Fless are Master and Padawan. I know some of these are already made, but I don't know where to even start looking for them. Sounds like quite the hefty request. Your best bet for some of these would be to look in the assets links on Gametoast under released assets. For the rest....well, may the force be with whoever even begins trying to model/head hack most of those. Can someone help my friend out here? He has a great idea all things considering. Location : Dantooine-east of the enclave. Dantooine-est de l'enclave. Posted around and this place is my last hope for support. I just need some one who is good at making textures, cause I need a decent amount for this new project. 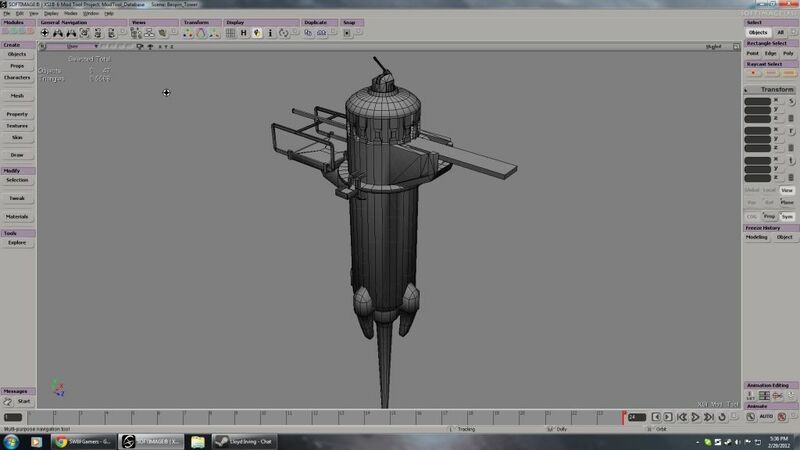 The project is set for two docking stations on Bespin. I just wanted textures that match the art style of the Bespin Platforms (with or without bumpmapping). There is a lot more that can be added but I just wanted to start with the two towers. Post if you have any questions or are interested. I want to make it more like a survival mode. Would it be possible to spawn 150 clones at a time and disable AI CIS spawn while allowing players to spawn as the Droids? Just to wrap things up and hopefully make things easier for anybody else who has this problem, I have uploaded an easy fix to this problem. Extract the vistamungefix folder into your C:\BF2_ModTools directory. Run the vistamungefix.bat located inside the vistamungefix folder. This will create a copy of the old munge batch files inside the assets folder and overwrite the originals with fixed munge batch files. This fix only changes the files in BF2_ModTools\data, so you will need make a new world for the fix to take effect. You only need to run the vistamungefix.bat once. This fix has no effect on maps you created prior to running the vistamungefix.bat. I also included a batch file that will restore the original files to their place just in case someone thinks this fix causes a problem. However, no one should need to use it since I just deleted an unnecessary redundancy that only the developers needed. If someone who already has the ModTools running properly were to run this, their munge process shouldn't be affected in the least. If anyone knows a better way of handling the fix (such as simply overwriting a line in a text file so that I don't have to include each fixed file in the download), please tell me so that I may update this. I have a few questions about where to edit some things. [b]How to use the Phase 1 clones instead of the Phase 2 clones. Can you explain how to do any of those? EDIT: Having trouble munging the SIDE's the munged and edited cis.lvl and cishell.lvl make the game crash. Glad visualmunge works for you now. You can post all those questions in the modding category. My request at the top of the page is still open for someone who can model me those. 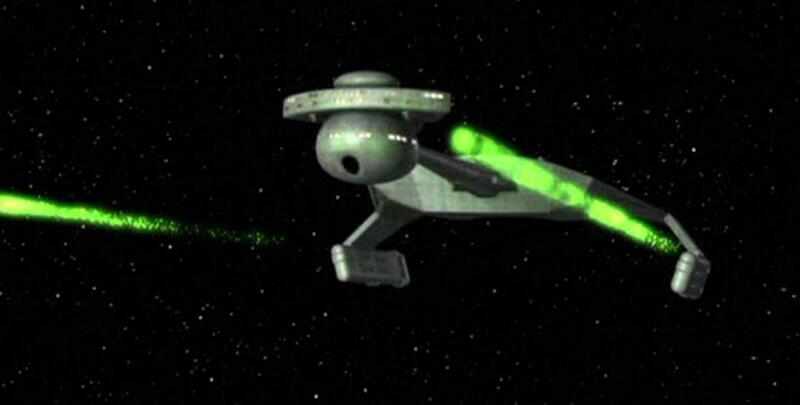 I know it's a Star Trek Klingon disruptor and this is blasphemous, but I kinda need it like that. I hope the reference is good enough. I wanted it for the Coynite Disruptor Rifle and I think it fits perfectly for it, even though in SWG the Coynite Disruptor rifle fired pure white. Or maybe the projectile could look more like the primary fire beam of the ASMD Shock Rifle (UT2003/2004 version), but in 'bolt' form. Whichever seems more 'disruptor' ish. I just wanna use something other than default bolts in my Lok map. I could use some help with a simple animation for when the droids go afk. Or if someone could teach me how to animate in this program it would work as well. Thanks! Here is the model link as I sais earlier the hardpoint_active need to be into the player model's hand. Many thanks guys, it will be very helpful for my mod. There is also the double handed dual weapons files, each set holds the weapons differently. Have you tried these files? Gametoast has em. You will have to search em.